Spring balanced mechanisms are in place to counteract the weight of the sliding sash window. This allows smooth operation with an effortless glide. For protection from the elements each vertical slider contains concealed low-level post co-extruded gaskets which provide superb protection. If you have small children, but want the beauty of sliding sash windows you can have restrictors fitted to stop the bottom sash from sliding fully. A great option to protect your children (and their little fingers). 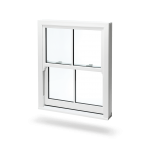 uPVC vertical sliding sash windows are equally as safe as any other window. They are also available with high security cam locks for added security and peace of mind. For a traditional aesthetic, optional sash horns enhance the appearance of your uPVC sliding sash windows. A built in pivot bar enables sashes to tilt inwards for cleaning. Extra ventilation is also created at the push of a button. 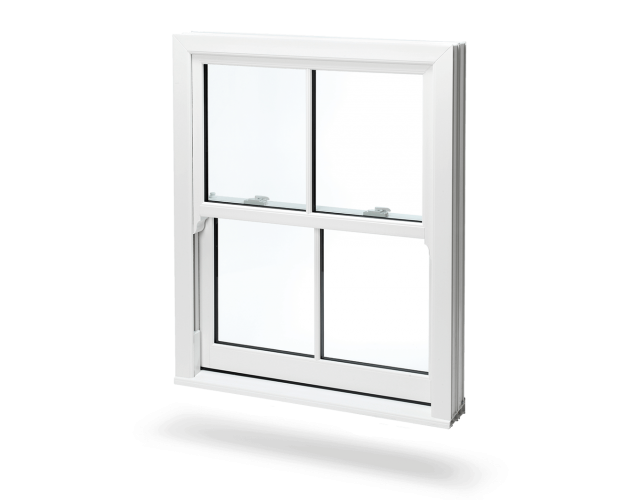 For a traditional and elegant look, uPVC vertical sliding sash windows are the perfect solution. Efficient, easy to use and authentic, our vertical sliding sash windows offer both style and functionality. Built to slide vertically, either downwards or upwards these windows are very easy to operate – a stark contrast to that of traditional sash windows. Smooth operation with effortless opening. Concealed low-level post co-extruded gaskets offer superb protection from the elements. Keep your children safe by fitting restrictors to stop the bottom sash from sliding fully. As safe as any other window when fitted with high security cam locks. Built in pivot bar provides inward tilting for easier cleaning.